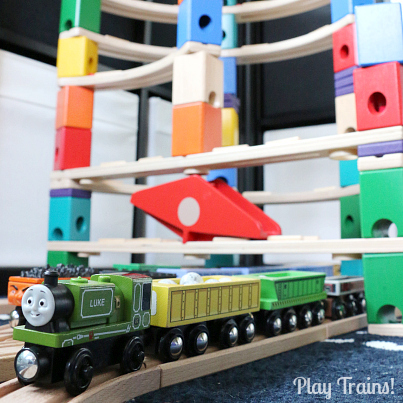 Does your child like real trains? 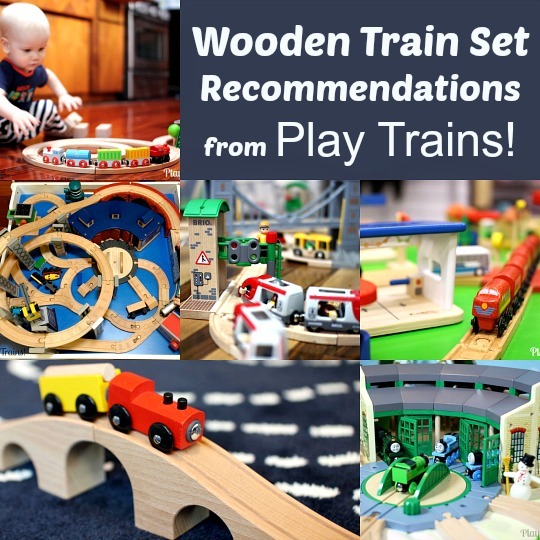 The bright colors and friendly faces found on many wooden trains appeal to a lot of children, but there are also plenty of kids who really want their toys to look like the real thing. And if you’re looking for wooden trains that truly look like real trains — or model trains — Whittle Shortline Railroad is the brand for you. 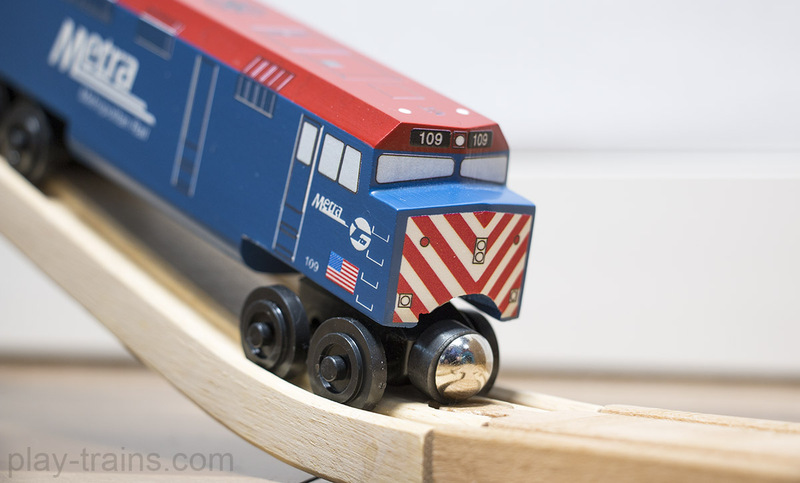 Read on in our Whittle Shortline Railroad review to find out more about these remarkable, handcrafted, realistic wooden trains that are kid safe and made in the USA. Whittle Shortline Railroad generously provided me with the trains in this post in expectation of my honest review. 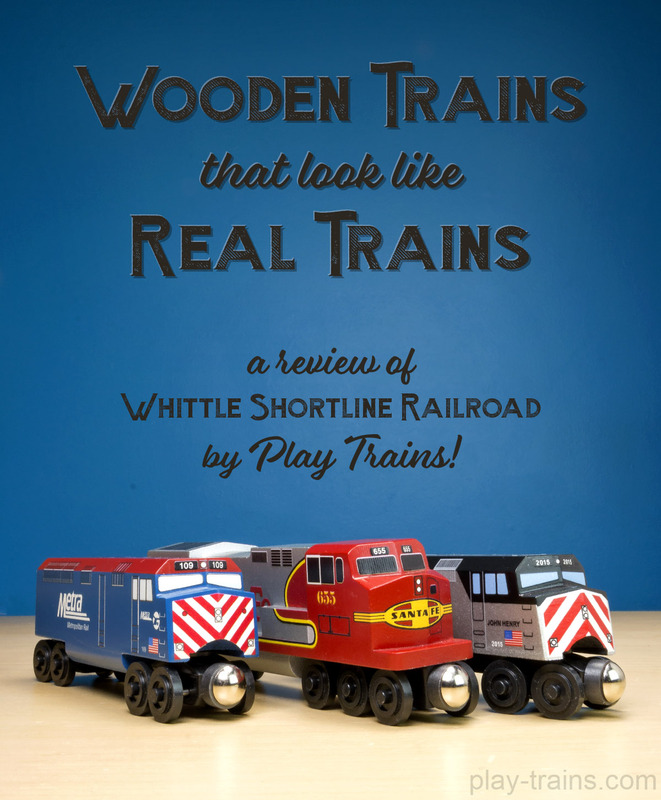 When Whittle Shortline Railroad contacted me and offered to send me trains to review, I was thrilled. I’ve always been curious about their trains. hardwood, with a commitment to making them as realistic as possible. 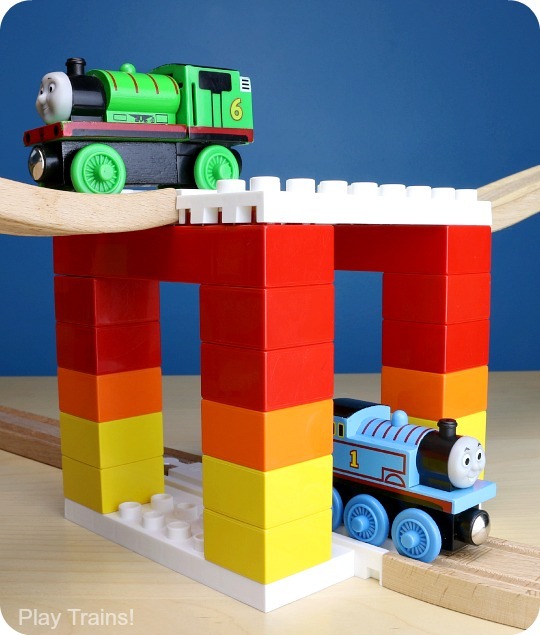 Their trains are compatible with major wooden train brands, including Thomas, Brio, and Chuggington. They use — and have always used — only kid-safe paints and finishes in making their trains. Whittle Shortline Railroad makes a variety of engines, freight cars, and passenger cars, painted and detailed to emulate North American trains, including Burlington Northern, Santa Fe, Union Pacific, CSX, Norfolk Southern, Canadian National, WSRR Streamliner, Metra, and more. Starting in December 2016, they’re releasing one new train a month, and you can sign up for their newsletter to hear about each new train as they are announced. Whittle Shortline Railroad also has a magazine coming in 2017, which I’m very interested to see! 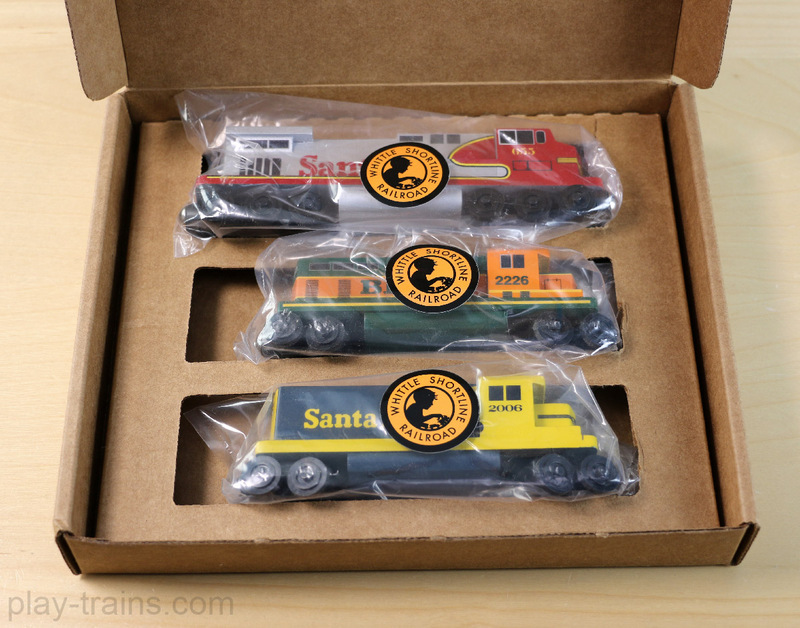 I really liked the way the trains were packaged when they arrived, in brown cardboard boxes with special inserts to hold the trains. Each engine and freight or passenger car came wrapped in a plastic bag, with a Whittle Shortline Railroad sticker adorning it. 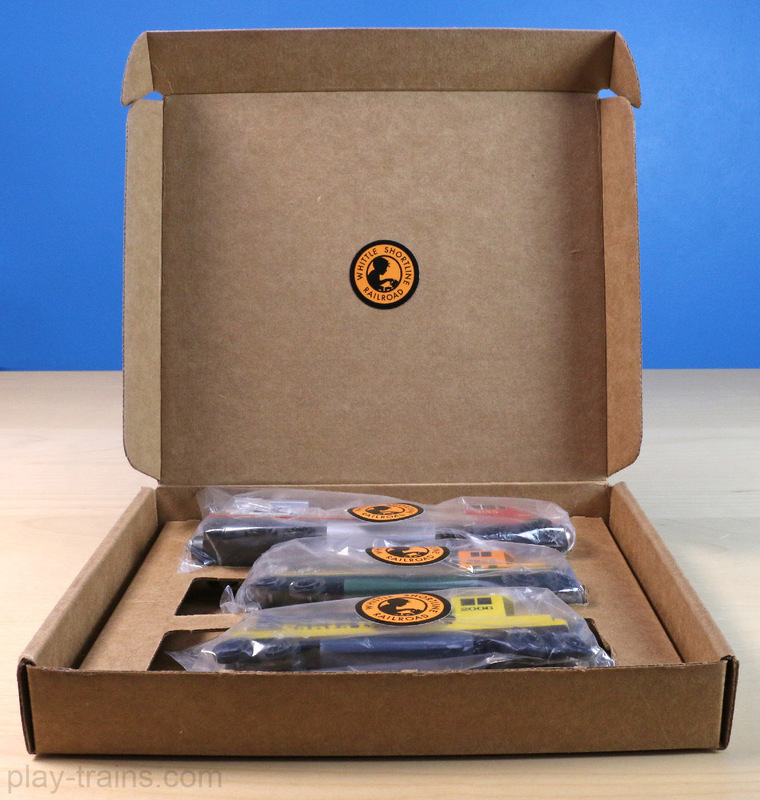 All in all, it’s a nice presentation that lets the trains shine when you open the box. Like I said above, we were thrilled to get a chance to check these trains out for ourselves. But the bigger thrill was opening the box and seeing the trains first hand. The level of detail, the handcrafted quality, the sheer size of the engines…the best word I can come up with to describe the effect in relation to other wooden trains is majestic. “Majestic” is kind of an odd word to have pop into one’s head while holding a wooden train. But to show you what I mean, let’s compare their largest engine style to a wooden train almost everyone is going to be familiar with. Remember, that little blue engine is often larger than many other brands of wooden trains! This Santa Fe is a C-44 diesel engine. With its length topping seven inches, it’s Whittle Shortline’s largest style of train. Their GP-38 engines are around five inches long, but that’s still a big wooden train, and Whittle Shortline’s passenger cars and some of their freight cars are nearly seven inches long. But it isn’t just the size of the trains that’s so impressive (a.k.a. majestic) in person. 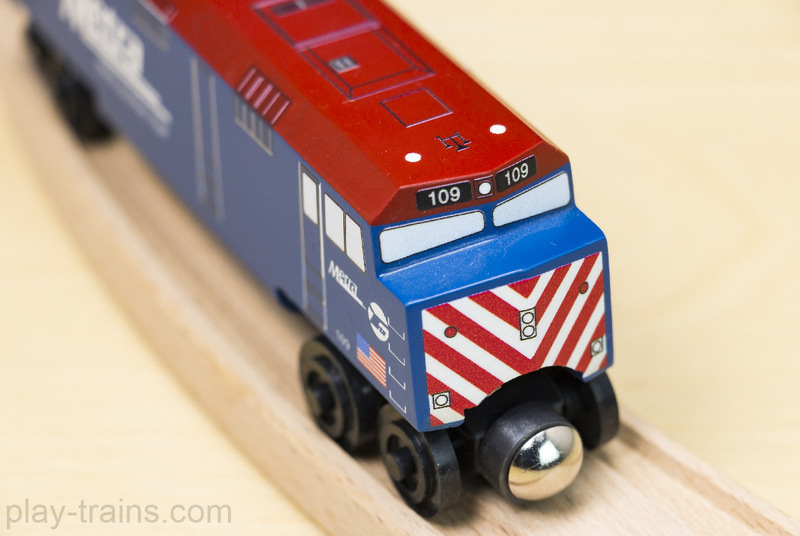 My husband spent about half an hour examining and praising the expert craftsmanship on the woodworking side of things, and he was quite impressed at how much of the trains are crafted from solid blocks of wood. (If you look carefully at a Thomas train, for example, you can see that several pieces of wood have been glued together to make the shape of the engine underneath the paint.) The crisp details, often adding a raised texture to the surfaces, combined with the vibrant paintwork make these bold trains stand out on the tracks. And the specially-designed wheels heighten the sense of realism, and definitely make the trains look more like model trains than any other wooden train I’ve seen. Especially because they’re able to get twelve wheels on their biggest engines! Let’s take a look at all of the beautiful engines, passenger cars, and freight cars we got to try out, and then I’ll tell you about our experience playing with them. 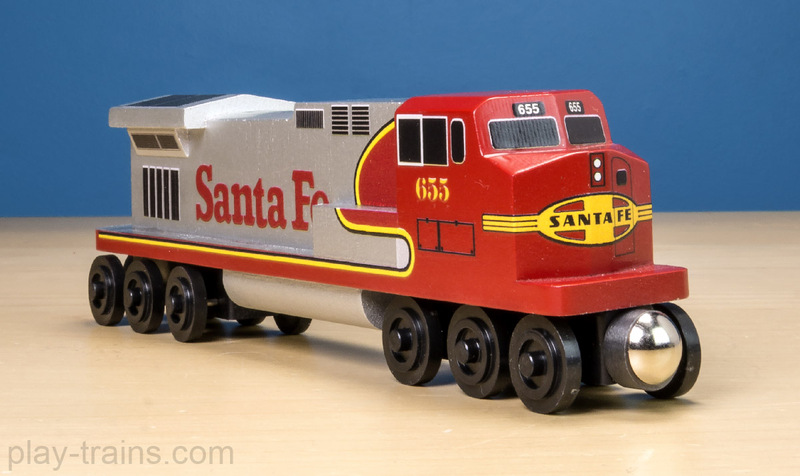 This Santa Fe C-44 — the one I compared to Thomas above — is just a show stopper of an engine. The red and yellow set against the metallic silver paint are just gorgeous in person — bright and bold and inviting. The Union Pacific “Flag” C-44 Diesel Engine is no less impressive. This one really brought home the realism of the trains for us, because we’ve seen plenty of these engines on the tracks here in the Seattle area. In the days we were testing out the trains, the Little Engineer and I stumbled into a photo of him watching a Union Pacific engine just like it on our Instagram account. 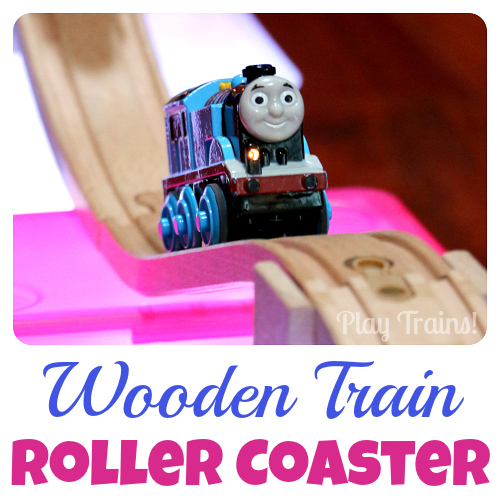 He thought that was so cool that this wooden train looked so much like the real one! Whittle Shortline Railroad’s GP-38 engines offer a smaller alternative to the C-44 engines. They are still impressively big, but a bit more versatile on the tracks (see our play observations below), and their lower price makes them more affordable. I love the vivid green and black Burlington Northern Green Diesel Engine, pictured here along with a Burlington Northern (BNSF) Boxcar. The BNSF “Pumpkin” GP-38 Diesel Engine is striking in its orange and green paintwork. 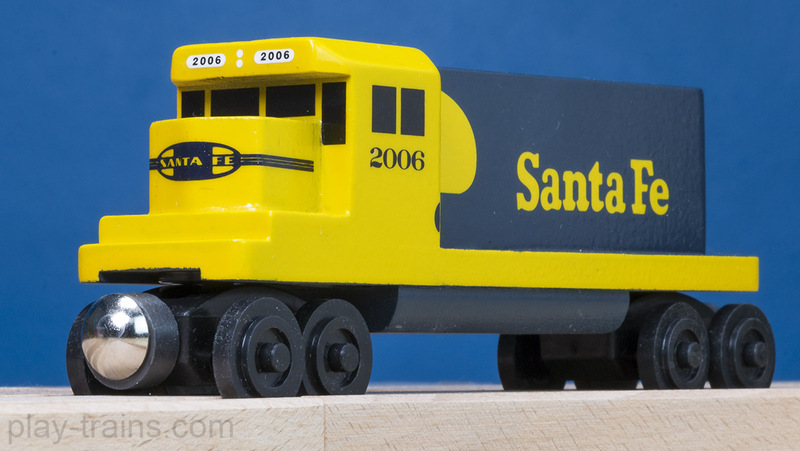 And the Santa Fe Yellow Bonnet Diesel Engine brings a cheerful burst of yellow to the tracks. And here’s a view from the back end of a GP-38 on the CSX CP-38 Diesel Engine. This is my son’s favorite of all the trains — no surprise, given that it’s blue. And now he wants a full set of CSX freight cars! If your child wants a train that looks like a real passenger train he or she has gone on, your best bet is a Whittle Shortline Railroad passenger train. 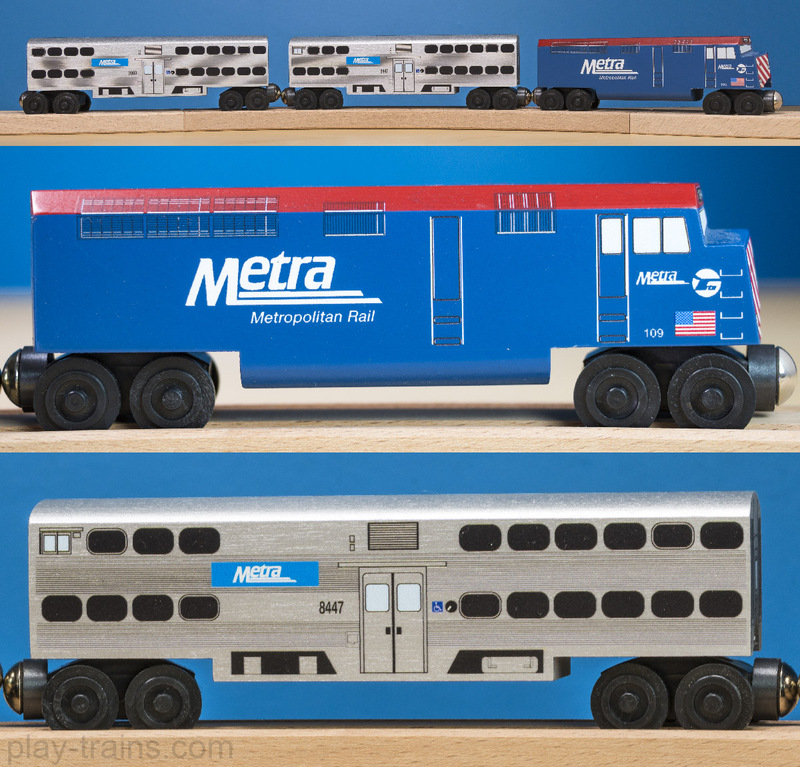 The double decker passenger cars in this Metra 3 Car Set and the set following it remind me strongly of two long-distance train trips I took as a teenager and young adult. Just look a the beautiful details on this train! And the Metra engine is such a bright combination of blue and red. 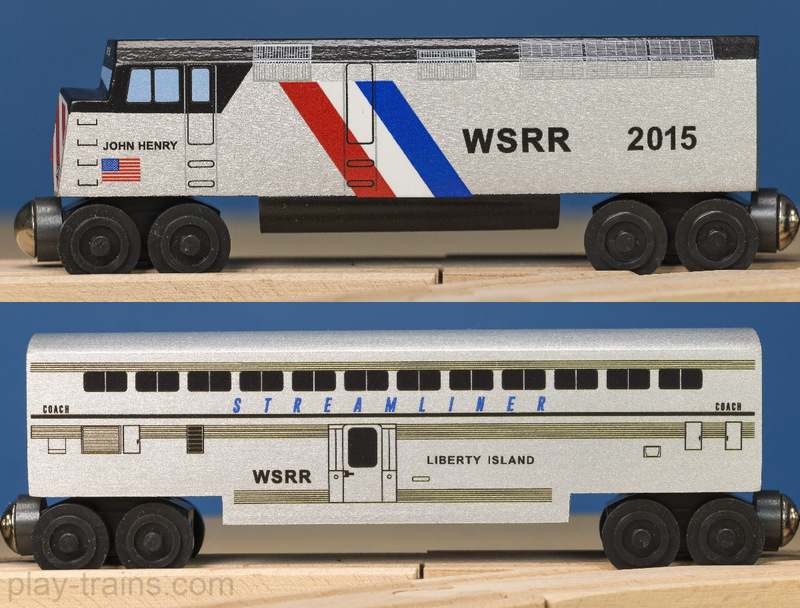 I also love the realistic look of the Streamliner John Henry Passenger Train Set. Again, the details are really impressive. This set comes with two slightly different, named passenger cars, which is fun. And I love the look of the Via Canada F-40 Engine 3 Piece Set. I just love all the tiny details, like the “A Green Choice” logo and the little Canadian flags on the side. I’m a really big believer that a wooden engine is only as much fun as the stuff it has to pull around the track, and Whittle Shortline Railroad offers some really outstanding freight cars to add to your freight yard. They come painted and detailed to look like freight cars from several different railroad companies, so you can fill out the train behind your Whittle Shortline engine in a realistic way. Note that you can also get them with the engines in several different train sets and mixed train sets. These sets look like a great deal over purchasing the engines and cars separately. Whittle Shortline’s double-stack cars, like this Maersk/Evergreen Double Stack Car and K-Line Double Stack Car, add even more realism to our trains for us — we see many of these shipping containers driving around our city and rattling past in the train yard near us! The dual freight containers are actually one piece of wood (otherwise the top one would constantly fall off, I’m sure). I really like the corrugated texture on the tops and sides. It would be nice if there was a magnet in the top to allow them to be picked up by wooden cranes, but that is one feature they’re missing. Still, after the blue CSX train, these seem to be my son’s favorite. 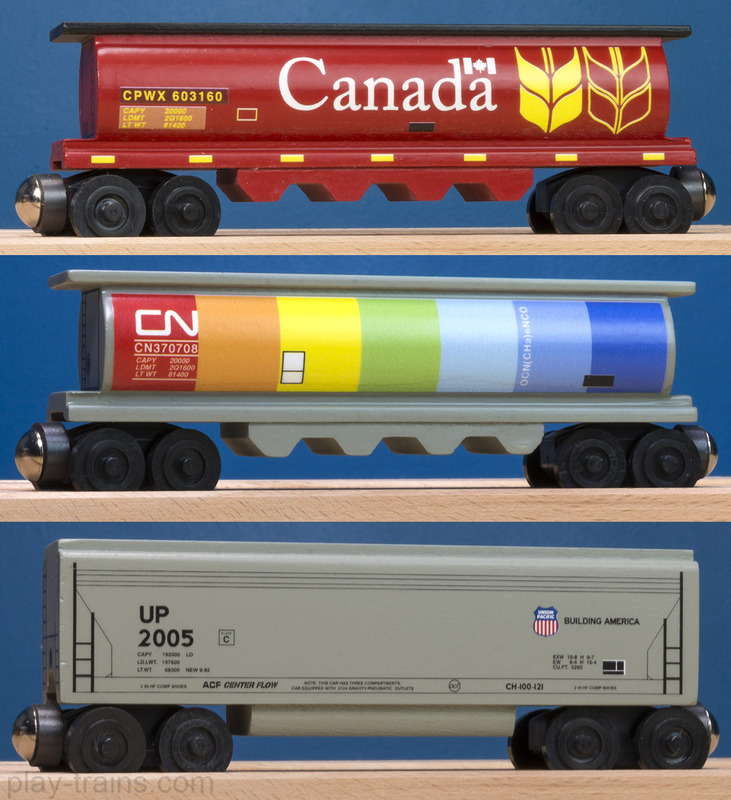 Whittle Shortline Railroad’s tanker cars are similar to other wooden train tanker cars, but the details — like on this Canadian National Tankcar — really set them apart. Open freight cars, like this CSX Hopper, are my favorite type of wooden train. 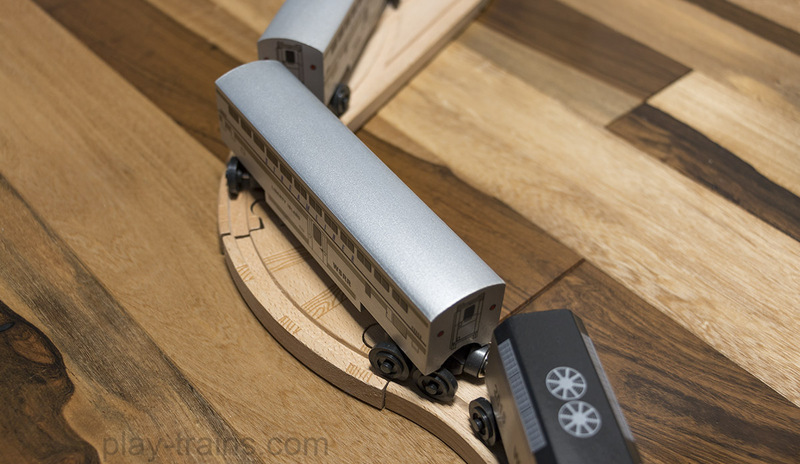 Whittle Shortline Railroad’s hoppers are beautifully made, with the openings cut out of a solid piece of wood. 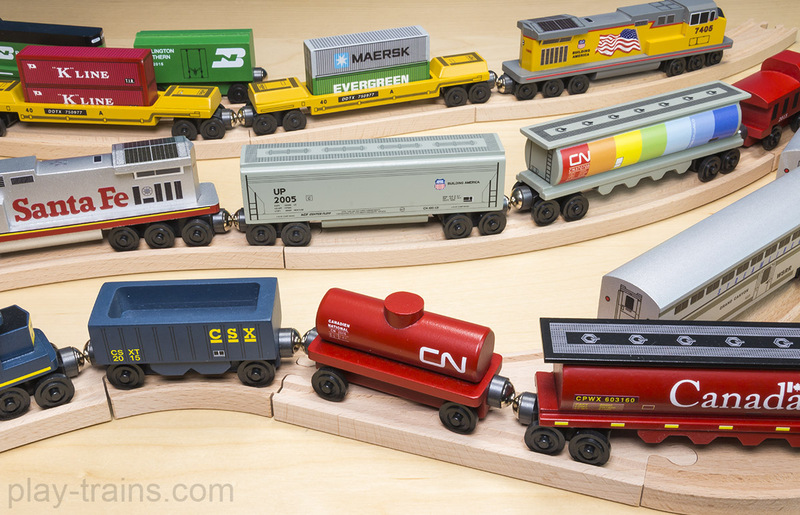 While they don’t fit the standard size of Thomas Wooden Railway freight, they do fit Brio freight and the smaller size of Thomas freight. And anything else you and your child want to put in them, of course! Whittle Shortline Railroad also makes these big cylinder hoppers that I think super cool. 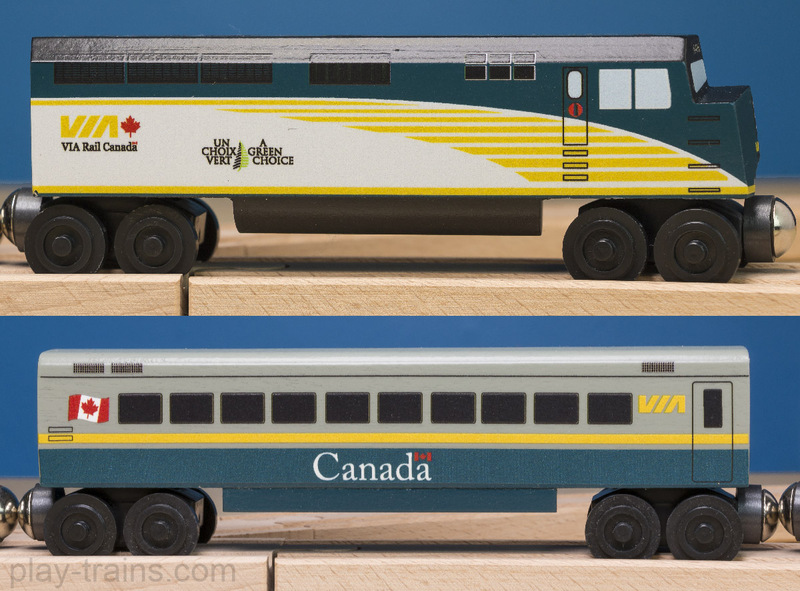 I love all the details on the Canada Wheat Cylinder Hopper, and the Canadian National Rainbow/Gray Cylinder Hopper is one of my favorite Whittle Shortline Railroad trains. They also make large covered hoppers like this Union Pacific Covered Hopper. For me personally, this doesn’t have quite the appeal of the brightly-colored trains, but I can see how it would make a great addition to a train set where realism is the guiding theme. Whittle Shortline Railroad also makes boxcars to go with their engines, like this Burlington Northern (BNSF) Boxcar. The peaked roof adds interest to an otherwise simple shape, and again the details and quality (this is cut from a single piece of wood) really make the difference here. And finally — fittingly, too — comes the caboose. I really, really love the shape of Whittle Shortline Railroad’s cabooses, and they make a nice variety of them. 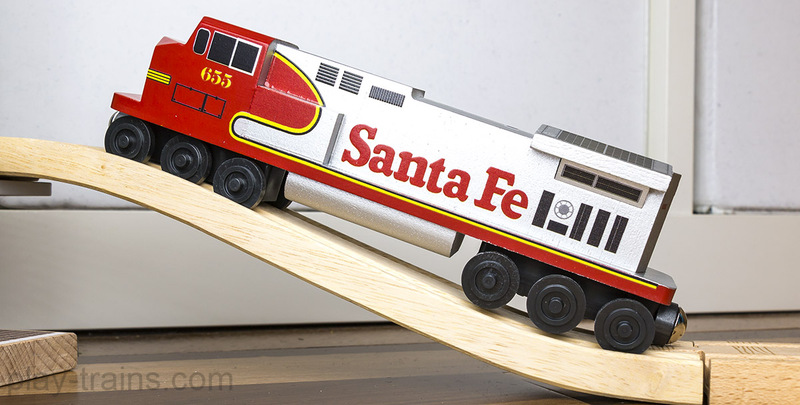 I must say that this Santa Fe Caboose is by far the best-looking one we own. So, after we had a good look at all the trains, we got down to the business of playing with them. First of all, they look really cool on a wooden train layout. I mean, don’t those just look like…trains? Will they go around tight curves? Will they go up inclines? Will they fit under bridges? Thanks to their special swiveling wheel assemblies, they do, indeed, go around the curves — quite impressively, as you can see! All three of those trains are fully connected by their (very strong!) magnets. 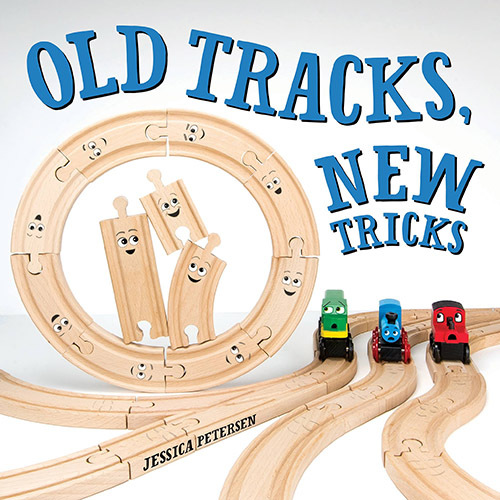 Their wheels roll so smoothly around the tracks, and swivel so neatly around the curves, that it feels pretty nice to push them around the twists and turns. There is one downside to having the wheels swivel so much, which is that sometimes when you’re driving over a split track, the back wheels want to take a different fork in the track than the front wheels. …and they don’t — which Whittle Shortline states clearly on the product page. They’re just too long, and the design doesn’t allow for the up-and-down movement that the wheels on some of their other trains have. The product page does say that they’re developing an incline that works with those trains, so I’m curious to see that in the future. The double-stack cars also bottomed out at the top of the inclines for us. Now, I was going to say this was a downside. But apparently it’s a matter of perspective, because when I asked the Little Engineer what his favorite part about the trains was, he said, “That they can’t go up and down the hills.” “What? Why?” I asked him, and he replied, “Because real trains can’t go up steep hills. It’s more realistic.” So there you go. We did have some success building inclines with them for the big trains with some of our spiral tracks, although you have to carefully maneuver the outside corners of the C-44 engines past the supports. The other engines can go up and down the hills. However, going downward, they sometimes get stopped short at the bottom of a descending track by running into a peg/male connector. This led me to notice that the design of those cool, swiveling wheels involves having the magnets be much lower than those on standard wooden train brands. (The magnets on some of Whittle Shortline’s smaller freight cars, which are more like the design of other wooden train brands, are actually higher than average.) However, other than the issue with stopping at the bottom of slopes, the lower magnets seem to work just fine and have no problem connecting up to any of the trains I tried with them. As for fitting under bridges, with the big C-44 engines, it depends on which wooden train brand the bridges come from. They’re slightly taller than Thomas engines, so anything a Thomas engine won’t fit under, the big engines won’t, and they just scrape by under the Thomas bridge I tried. But the other styles of Whittle Shortline Railroad trains fit about the same as Thomas trains do. All that said, these trains are so beautiful and realistic, and they roll so well on the track and feel so satisfying in your hand, that I think it’s worth building a layout that suits them. If you have a C-44 locomotive, you can build a very satisfying layout with curves and straights to run along, and it would be really fun to build a freight yard for these engines to pick up freight cars from — that’s actually the next thing we’re planning to do with them! My final verdict is that I highly recommend Whittle Shortline Railroad trains. In fact, if anyone has a time machine, I’d really like to go back in time four years and tell myself to get some for the Little Engineer. On the other hand, they’re coming into our house at a great time, when his affection for Thomas is on the wane, and he thinks these are really cool. The quality is superb, the realism unmatched by any other brand. 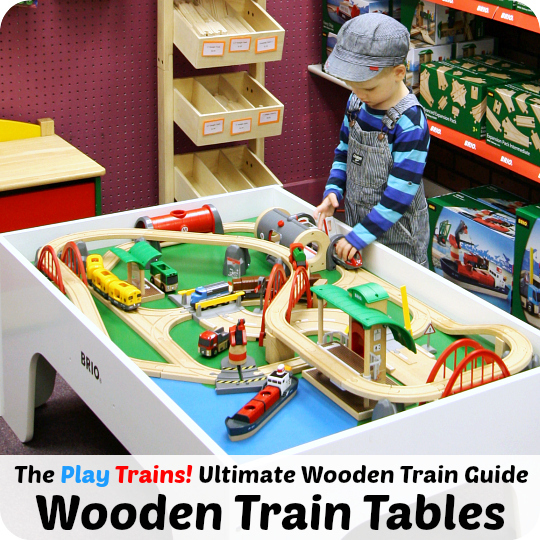 The wheels roll smoothly on the tracks, and the tactile sensation of holding these solid wooden trains, with their heft, is really nice. They would be equally at home in a child’s hand or an adult collector’s display shelf. Children who are fascinated by real trains. 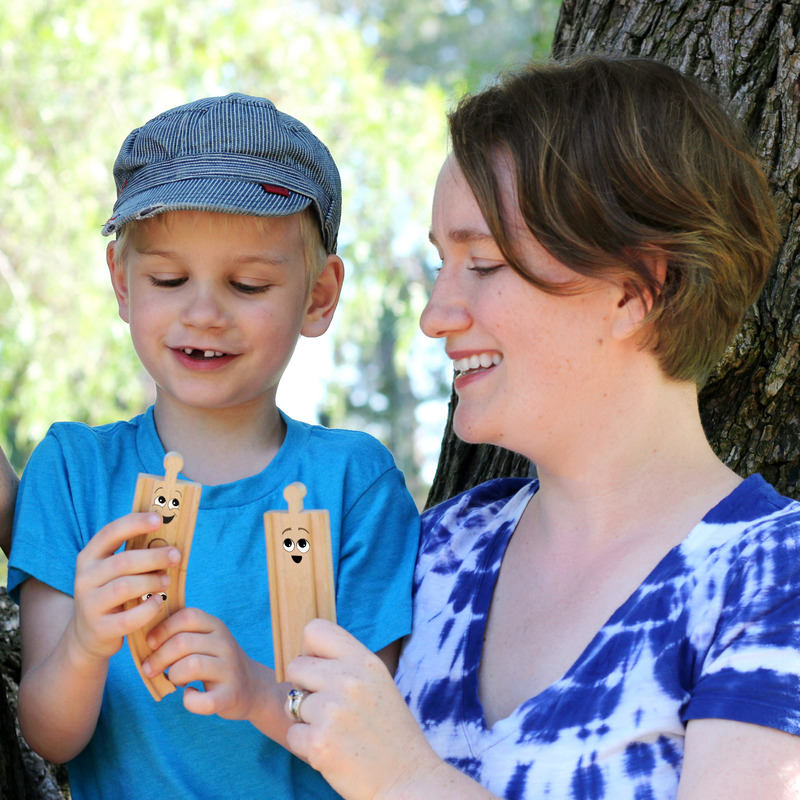 Families that want to capitalize on a child’s interest in character trains and broaden it to include the real things. Children who desperately want an electric model train, but who are too young to safely operate one. 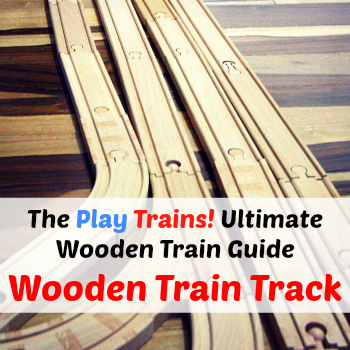 Anyone who wants high quality, made-in-the-USA wooden trains. Children’s museums, railroad museums, and schools. Train collectors who want an unusual and attractive addition to their collections. You can learn more about all these trains and more at the Whittle Shortline Railroad website.